this higerh latency . Short spikes in the upload are possible. CHANGED: USC: Take allowed overhead out highest allowable class. CHANGED: USC: take tcp/ip overhead more into account. CHANGED: Some bindipadress in preferences could cause exceptions. CHANGED: Mulelistcontrol: change moment of update of display. for very high uploader (> 200 kb/s) and/or slow cpu some cpu can be saved. FIXED: File completion of files over 4GB. - Default to category 0, if all other methods don't match. FIXED: Command line: Do not start after "emule exit" and emule was not running. ADDED: More Webcache statistics displayed. CHANGED : Dynamic Block Request, number of requested blocks. FIX: LOG: Chrash on adding ed2k link. CHANGED: Slotlimit: upspeed/3 is now per class. /!\: You will notice higher and proper overhead display on graph. NOTE: sorry for those numerous update, but i don't have a proper webcache proxy hunder the hand. Anyway if i had not dig a bit the code this feature will have still useless for ever. Now every thing is ok, i finaly found why WCBlock were not properly spreaded as in the old offcial webcache client. - this make 1.8MB/s limit rise up to ? - not limmited, Where the upload code decides to open more slots as needed. - a set number 60-255, for high speed uploaders that wants to limit the upload slots manually. - there is a bug but i got headache to fix it, maybe something arround gaplist. 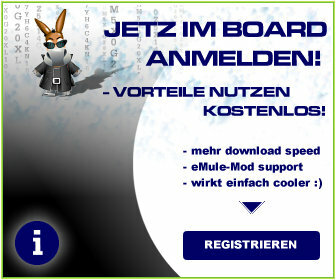 here we go with the new Morph Mod version based on the latest eMule 0.47a. We finaly eradicate those nasty crash coming from SlugFiller mod when a file complet. Ich wünsche allen Leuten viel Spaß mit dieser Version! irgendwie kann ich nicht mehr zu razorback connecten und die deutsche lang downloaden !? 28.01.2006 10:16:34: Failed to download and install selected language dll from http://langmirror1.emule-project.org/lang/047050/de_DE.dll! 28.01.2006 10:26:43: Razorback 2 (195.245.244.243:4661) appears to be dead. Das ging schnell, gute Arbeit! werd mir das mal zu gemüte führen und meldung machen wenn ich durch bin. ähm.. Slotfocus funzt da irgendwie nich sonderlich, oder? prob bekannt, sirob arbeitet dran. hast du die nötigen datein für die länderflaggen denn im config ordner¿ ohne sie wird es nicht gehen! haste mal link wo ich die herbekomm? *g* hab das paket noch garnicht geladen arbeite nur mit der cvs version... wie dem auch sei, nimm einfach den config ordner der 7.8! funktioniert es dann nicht müßen wir weiter suchen. denk dran, neustart zwingend erforderlich... glaub ich ne... keine Ahnung. musst mal bissn probieren. Schnell is er ja. 1 Stunde Laufzeit und Durchschnitt 42KB/s. Das ist wirkilich Gut. Naja der Upload ist wirklich daneben aber man Arbeitet ja dran. Ansonsten keine Bugs die ich feststellen kann. Sorry Leute, habe beim Warnungs-Killen einen herben Fehler gemacht. hier das Changelog etc für 8.1! Dieser post ist kompletter als der, meines vorgängers. Bitte keinen anstoß an dem nun doppelten postings des changelogs finden. danke.